An Agency Manager’s chief responsibility is to manage the agency’s Sales channel, it is the responsibility of these agency Managers to manage the agents, train and assist them in achieving the sales target. Some of the basic job tasks that are to be shouldered by the Agency managers include planning and setting targets for the salesmen, formulating sales strategies, recruiting and managing agency channel team, training, motivating and developing team members. However, the role of an Agency Manager varies from company to company. Even though an Agency Manager’s responsibility is sales target achievement, they are expected to exhibit effective team management, leadership, sales acumen, result orientation, and strong interpersonal skills. A degree may not be needed for becoming an agency manager, even a high school Diploma would be sufficient for this job post. However, specialization in business studies, human geography, travel, tourism, social studies, and economics may enhance chances in Agency Manager Resume Sample. 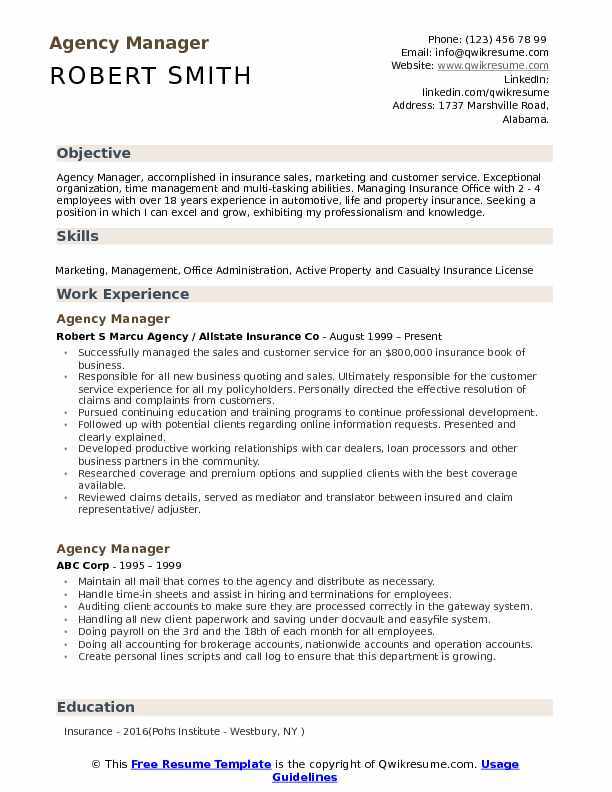 Summary : Agency Manager, accomplished in insurance sales, marketing and customer service. Exceptional organization, time management and multi-tasking abilities. Managing Insurance Office with 2 - 4 employees with over 18 years experience in automotive, life and property insurance. 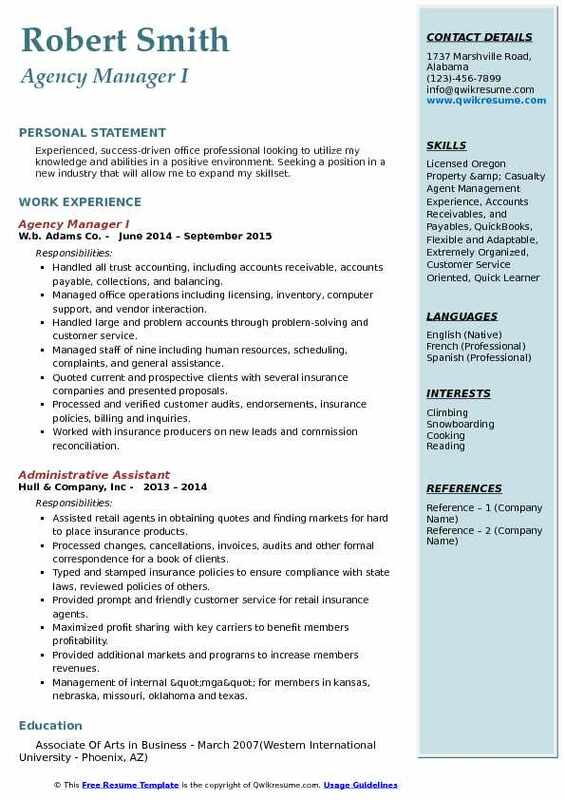 Seeking a position in which I can excel and grow, exhibiting my professionalism and knowledge. Successfully managed the sales and customer service for an $800,000 insurance book of business. Responsible for all new business quoting and sales. Ultimately responsible for the customer service experience for all my policyholders. Personally directed the effective resolution of claims and complaints from customers. Followed up with potential clients regarding online information requests. Presented and clearly explained. Reviewed claims details, served as mediator and translator between insured and claim representative/ adjuster. Developed property and casualty insurance and commercial insurance leads to meet monthly sales targets. Headline : To secure a management position within your agency where my skills and experience can be utilized and further developed. Solid Knowledge of the Insurance Industry with Property and Casualty License. 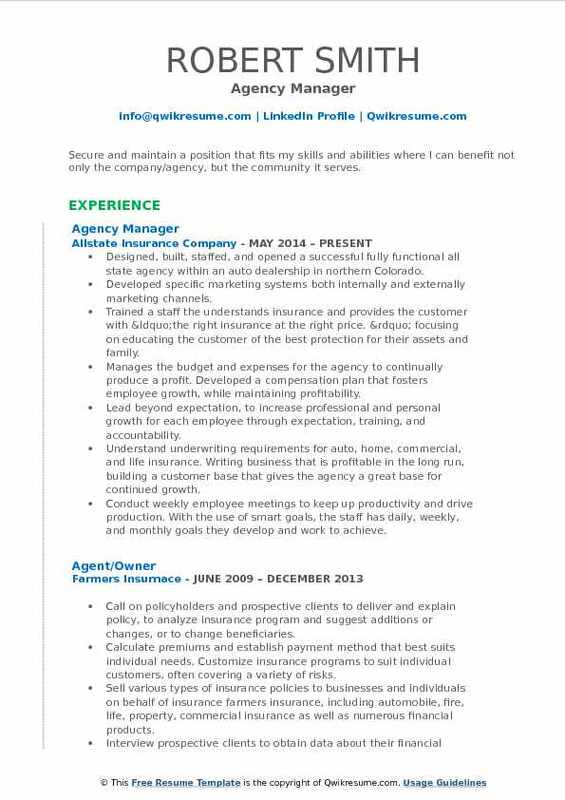 Experienced Underwriter (capable Of Determining Insurable Risks). Develop new and innovative marketing strategies to ensure agency profitability and penetrate new markets. Prepare action plans for individuals who struggle to meet sales minimums to help bring them up to the task. Driving sales, developing and managing agents; training, coaching, cross-selling and developing relationships with strategic partnerships. Handle all agency compliance issues and outstanding trailing documents. Create and maintain monthly reports tracking both agency and individual item count, premium count, lead sources, and LSP quote activity. Strictly enforce and adhere to all company policies, procedures, and company code of ethics. Promptly communicate all companywide guideline changes to staff members. Maintain contact with all agency clients to ensure high levels of customer satisfaction. 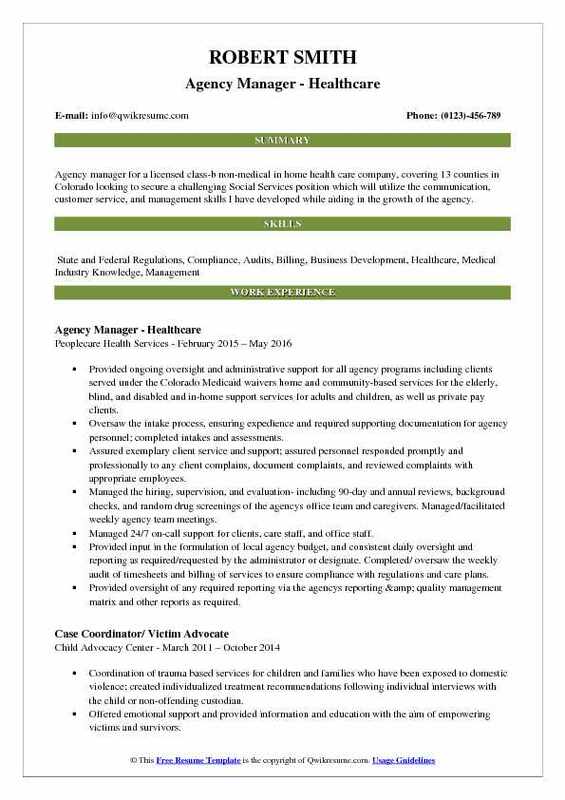 Objective : Agency manager for a licensed class-b non-medical in home health care company, covering 13 counties in Colorado looking to secure a challenging Social Services position which will utilize the communication, customer service, and management skills I have developed while aiding in the growth of the agency. Provided ongoing oversight and administrative support for all agency programs including clients served under the Colorado Medicaid waivers home and community-based services for the elderly, blind, and disabled and in-home support services for adults and children, as well as private pay clients. Oversaw the intake process, ensuring expedience and required supporting documentation for agency personnel; completed intakes and assessments. Assured exemplary client service and support; assured personnel responded promptly and professionally to any client complains, document complaints, and reviewed complaints with appropriate employees. Managed the hiring, supervision, and evaluation- including 90-day and annual reviews, background checks, and random drug screenings of the agency's office team and caregivers. Managed/facilitated weekly agency team meetings. Managed 24/7 on-call support for clients, care staff, and office staff. Provided input in the formulation of local agency budget, and consistent daily oversight and reporting as required/requested by the administrator or designate. Completed/ oversaw the weekly audit of timesheets and billing of services to ensure compliance with regulations and care plans. Provided oversight of any required reporting via the agency's reporting & quality management matrix and other reports as required. Maintained knowledge of and ensured company compliance with all applicable local, state, and federal laws and regulations concerning the operation and provision of home care services including but not limited to all ongoing requirements for continuing professional education. Actively cultivated strong communication/relationships throughout the service area; aided in establishing and maintaining a strong company reputation. 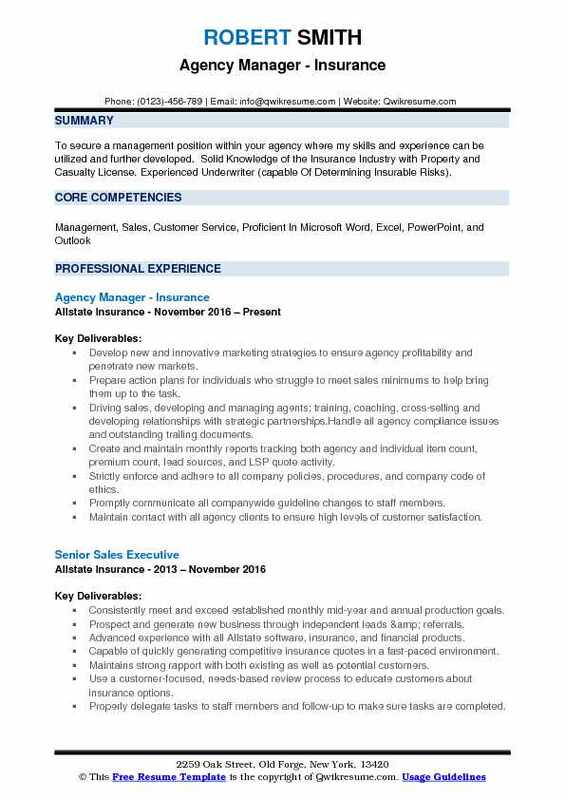 Summary : Secure and maintain a position that fits my skills and abilities where I can benefit not only the company/agency, but the community it serves. Designed, built, staffed, and opened a successful fully functional all state agency within an auto dealership in northern Colorado. Developed specific marketing systems both internally and externally marketing channels. Trained a staff the understands insurance and provides the customer with “the right insurance at the right price. ” focusing on educating the customer of the best protection for their assets and family. Manages the budget and expenses for the agency to continually produce a profit. Developed a compensation plan that fosters employee growth, while maintaining profitability. Lead beyond expectation, to increase professional and personal growth for each employee through expectation, training, and accountability. Understand underwriting requirements for auto, home, commercial, and life insurance. Writing business that is profitable in the long run, building a customer base that gives the agency a great base for continued growth. Conduct weekly employee meetings to keep up productivity and drive production. With the use of smart goals, the staff has daily, weekly, and monthly goals they develop and work to achieve. Managing, maintaining and monitoring the start, finalizing and closing of quality insurance policies that fit the individual needs of each customer. Supervision of all phases of sales and customer service process including all office personnel during the entire process prepare policies to the specifications for the specific customer. Objective : Experienced, success-driven office professional looking to utilize my knowledge and abilities in a positive environment. 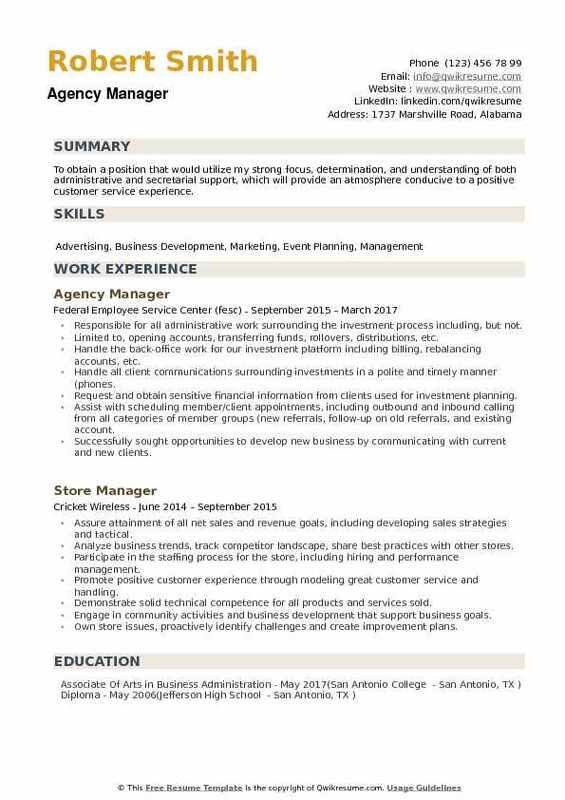 Seeking a position in a new industry that will allow me to expand my skillset. Handled all trust accounting, including accounts receivable, accounts payable, collections, and balancing. Managed office operations including licensing, inventory, computer support, and vendor interaction. Handled large and problem accounts through problem-solving and customer service. Managed staff of nine including human resources, scheduling, complaints, and general assistance. Quoted current and prospective clients with several insurance companies and presented proposals. Processed and verified customer audits, endorsements, insurance policies, billing and inquiries. Worked with insurance producers on new leads and commission reconciliation. Promoted twice, starting in an entry-level position and ending as general manager of the agency. Maintained positive relationships with insurance companies, underwriters, and brokers. Established and implemented procedures to ensure clients had adequate coverage and agency complied with all insurance company guidelines as well as state laws. 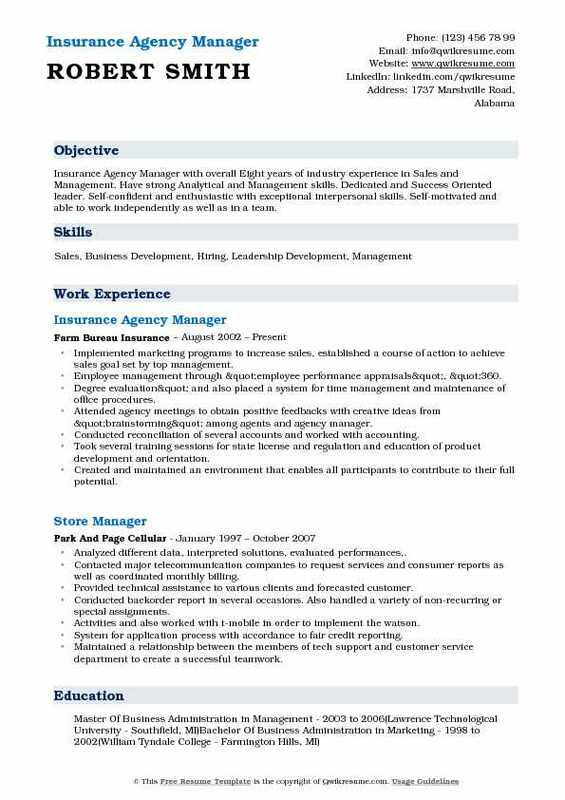 Summary : Insurance Agency Manager with overall Eight years of industry experience in Sales and Management. Have strong Analytical and Management skills. Dedicated and Success Oriented leader. Self-confident and enthusiastic with exceptional interpersonal skills. Self-motivated and able to work independently as well as in a team. Implemented marketing programs to increase sales, established a course of action to achieve sales goal set by top management. Employee management through "employee performance appraisals", "360. Degree evaluation" and also placed a system for time management and maintenance of office procedures. Attended agency meetings to obtain positive feedbacks with creative ideas from "brainstorming" among agents and agency manager. Conducted reconciliation of several accounts and worked with accounting. Took several training sessions for state license and regulation and education of product development and orientation. Created and maintained an environment that enables all participants to contribute to their full potential. Maintained relationship with existing clients by continuing policy reviews and recommendation. 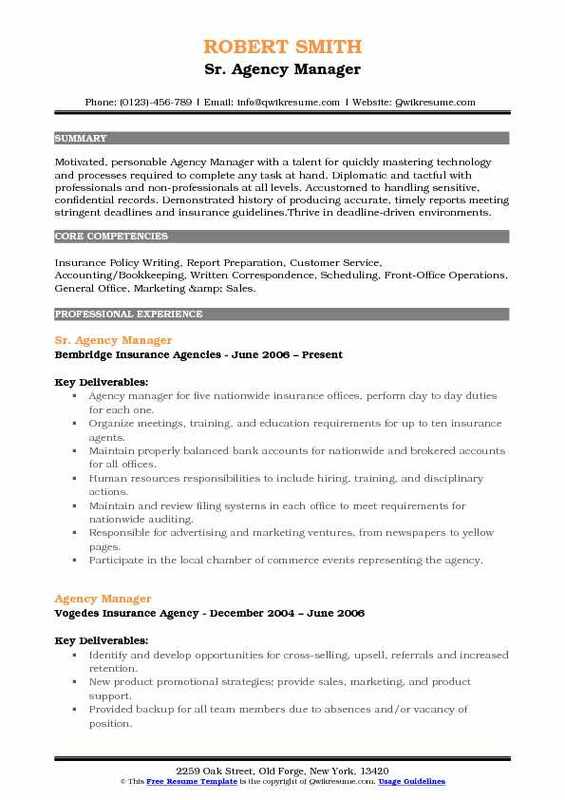 Summary : Highly-motivated Insurance Agency Manager trained in financial accounting and cost estimation. Consistently increases sales and expands client base through targeted marketing, leadership development and in-depth knowledge of market trends. Met with an average of 10 walk-in policyholders to address and resolve complaints per day. Met with 25 existing and prospective clients each week to select appropriate insurance policies. Financial plans for prospects using insurance products. Collect monthly premiums from customers every month at their homes to ensure payment and coverage. Process policy endorsements, payments, reinstatements and new business applications in the office and by telephone. Answer customers questions and solving concerns regarding their insurance. Contacting customers for follow-ups and or giving insurance quotes. Understand, promote and remain current on carrier underwriting guidelines, announcements, and memos related to changes in carriers policies and procedures. Meet sales goals through new product sales, cross-selling and retention of the current customer. Summary : Motivated, personable Agency Manager with a talent for quickly mastering technology and processes required to complete any task at hand. Diplomatic and tactful with professionals and non-professionals at all levels. Accustomed to handling sensitive, confidential records. Demonstrated history of producing accurate, timely reports meeting stringent deadlines and insurance guidelines.Thrive in deadline-driven environments. 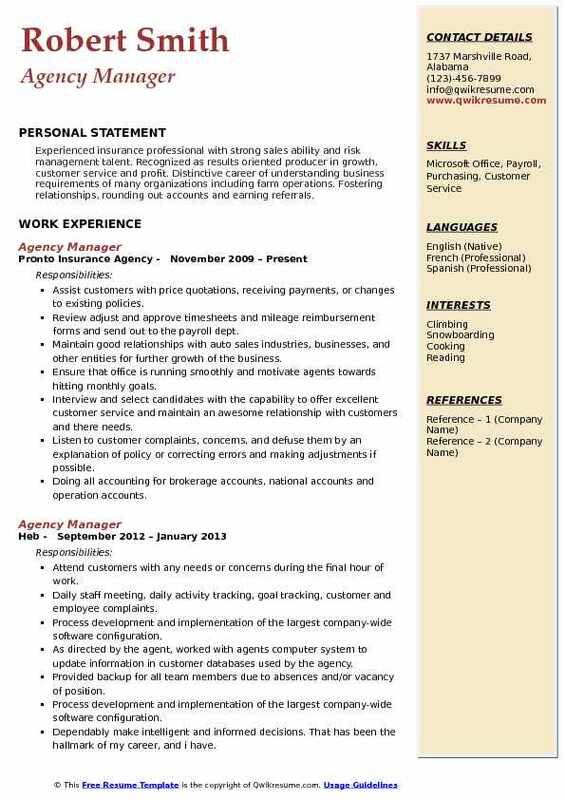 Skills : Insurance Policy Writing, Report Preparation, Customer Service, Accounting/Bookkeeping, Written Correspondence, Scheduling, Front-Office Operations, General Office, Marketing & Sales. 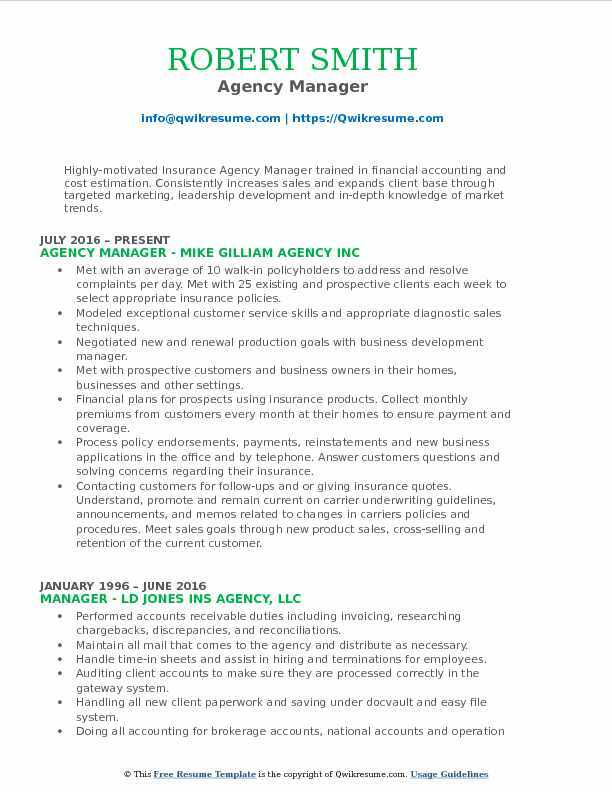 Agency manager for five nationwide insurance offices, perform day to day duties for each one. Organize meetings, training, and education requirements for up to ten insurance agents. Maintain properly balanced bank accounts for nationwide and brokered accounts for all offices. Human resources responsibilities to include hiring, training, and disciplinary actions. Maintain and review filing systems in each office to meet requirements for nationwide auditing. Responsible for advertising and marketing ventures, from newspapers to yellow pages. Participate in the local chamber of commerce events representing the agency. Provided prompt, accurate, friendly, cost-effective service by responding to inquiries from existing policyholders (handle over 15000 households currently). Risk analysis and quality management for the largest property and casualty insurer in the united states. Headline : Experienced insurance professional with strong sales ability and risk management talent. Recognized as results oriented producer in growth, customer service and profit. Distinctive career of understanding business requirements of many organizations including farm operations. Fostering relationships, rounding out accounts and earning referrals. Assist customers with price quotations, receiving payments, or changes to existing policies. Review adjust and approve timesheets and mileage reimbursement forms and send out to the payroll dept. Maintain good relationships with auto sales industries, businesses, and other entities for further growth of the business. Ensure that office is running smoothly and motivate agents towards hitting monthly goals. Interview and select candidates with the capability to offer excellent customer service and maintain an awesome relationship with customers and there needs. Listen to customer complaints, concerns, and defuse them by an explanation of policy or correcting errors and making adjustments if possible. Doing all accounting for brokerage accounts, national accounts and operation accounts. Objective : To obtain a position that would utilize my strong focus, determination, and understanding of both administrative and secretarial support, which will provide an atmosphere conducive to a positive customer service experience. Responsible for all administrative work surrounding the investment process including, but not. Limited to, opening accounts, transferring funds, rollovers, distributions, etc. Handle the back-office work for our investment platform including billing, rebalancing accounts, etc. Handle all client communications surrounding investments in a polite and timely manner (phones. Request and obtain sensitive financial information from clients used for investment planning. Assist with scheduling member/client appointments, including outbound and inbound calling from all categories of member groups (new referrals, follow-up on old referrals, and existing account. Successfully sought opportunities to develop new business by communicating with current and new clients.